Goats R Us is a family owned and operated grazing company. Our livestock are utilized primarily for fuel mitigation and star thistle eradication, although they have also gained quite a reputation for brush reduction projects. 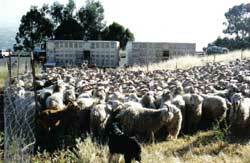 The herd is a melting pot of breeds: Angora, Alpine, Spanish, Boer, Pygmy, La Mancha, and Nubian. 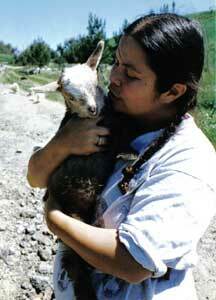 The goats are separated into several herds of various sizes, depending on the scope of work. Goats R Us is hired by homeowners, private land managers, and public agencies to graze sites ranging from neighborhood yards to 30,000 acre ranches. Each herd is maintained by a shepherd and his Border Collie, who live with the animals on the premises in a self contained travel trailer. In open space areas, they work "free,” supervised by the man and dog team, and are secured at night in holding pens. This range work is often accomplished on horseback, reducing the use of motor vehicles in these areas. When working sites near residential neighborhoods, portable electric fencing is used to contain the goats. We also offer hand clearing in conjunction with the grazing to provide a complete weed abatement program for very dense or sensitive landscapes. Their annual visits have become very popular with the public and indeed have turned into somewhat of a local event!